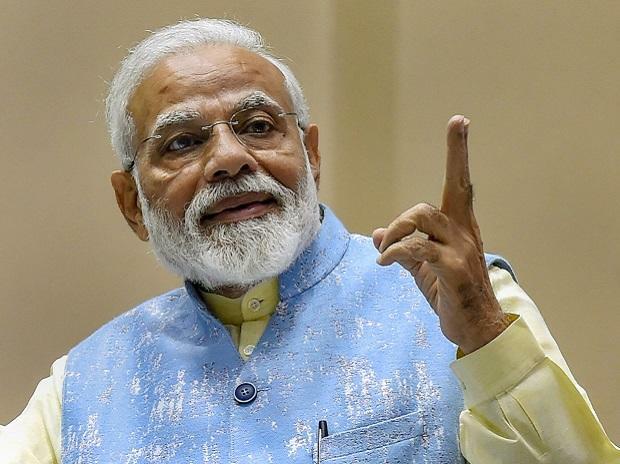 Prime Minister Narendra Modi on Saturday accused the Opposition of playing politics over the Rafale deal, saying the entire country was now feeling the need of these fighter planes. “The country has felt the shortage of Rafale jets. Today, India is asking in one voice what could have happened if we had Rafale. First selfish policies and then politics over the Rafale deal have harmed the nation,” Modi said at the India Today Conclave in the national capital. The PM’s remarks came days after the Indian Air Force (IAF) struck the biggest training camp of Jaish-e-Mohammad inside Pakistan in a pre-dawn operation. In the subsequent confrontation, both countries shot down each other’s jets, with Pakistan capturing one IAF pilot, Wing Commander Abhinandan Varthaman. He was released on Friday. The PM said fear had been created among anti-national elements both within and outside India, and that recent events showed India’s foreign policy clout. He also sought to differentiate between the programmes of his government such as the PM Kisan Nidhi Yojana and those of the previous United Progressive Alliance (UPA) regime such as farm-debt waiver. He alleged that the previous governments were only interested in commissions, deals in defence, and offering doles to the poor in their programmes. “Those who ruled the nation for many years have interest in only two things — doles and deals. The culture of doles and deals has harmed our nations’s development journey greatly. The biggest sufferers of this approach were kisan (farmers) and jawans (soldiers),” he said. He said defence modernisation did not happen in the previous regimes. “Who is every dealmaker close to? Who is every middleman close to? The entire nation knows and Lutyens Delhi surely knows,” he said. 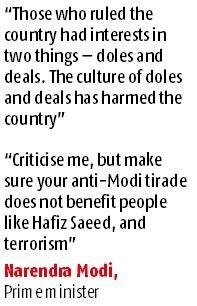 The PM said the Opposition’s hatred for Modi had now expanded to their hatred to the nation. He said his government’s schemes and programmes such as PM Kisan speak volumes about comprehensive focus on the targeted beneficiaries against tokenism offered by the UPA such as farm-debt waiver. As such, he said he got the people’s mandate to meet their needs in 2014, while 2019 would be the mandate for meeting their aspirations. “Unlike farm-debt waiver, PM Kisan is a long-term and long-lasting scheme,” Modi said. The PM similarly criticised the UPA government for “half-heartedly implementing” its much-talked about Food Security Act in just 11 states, putting hike in the minimum support price for crops on the cold storage. Earlier at the same event, Finance Minister Arun Jaitley dismissed the criticism of his government for the alleged jobless growth. He said the economy had been growing at an average growth rate of 7-7.5 per cent a year for five years. He called the mahagathbandhan of opposition parties as the common programme of ‘Nawabs of Negativity’, aimed at removing only one man from the power. Jaitley also took on former prime minister Manmohan Singh for saying that the recent incidents between India and Pakistan reflected “a mad rush for destruction by two nations”. “You (Manmohan Singh) are equating the victim of terrorism with the perpetrator of terrorism,” he said.